This time of year can be exciting and stressful; happy and sad; exhilarating and disappointing all wrapped up into one. Wednesday was a mix of emotions for me and many of you. I was so happy to welcome Samantha Denman to our 2nd grade team and Fred Neuhausal as our Spanish teacher. Then, I had to tell Amy and Cheri that they were moving to other buildings. As I reflect on this day, I realize that often times endings and beginnings happen at the exact same time. For Samantha it's the end of stressing out about getting a full time position and the beginning of her dream of having her own classroom. For Fred, it's the end of being a high school Spanish teacher in a place where he certainly feels comfortable and knows what to do and the beginning of a new program at an elementary school where his son attends! These are exciting endings and beginnings. For Cheri and Amy it seems a little different. They're ending many years at a school they love, in a place where their friends are and where they feel comfortable to embark on new adventures in new buildings. Endings and beginnings-they can be bitter sweet; they can be so many different things to different people. One thing that is the same about the endings and beginnings that I experienced today is that each person graciously accepted their ending and greeted their beginning with a positive mindset and a desire to serve children. What a team we have here. I could not be more excited to see what the future holds for us. I leave you with one of my favorite quotes and I encourage you to consider how you look at endings and beginnings. What if this is not the end. What if it is not even the beginning of the end. What if, perhaps it is simply the end of the beginning. ​We're on a journey this is not the destination. Here is your staff update for April 18th. After 7 years at JW Reason, I truly feel like I've seen the increase in poverty right before my eyes. We see more and more students struggling with food insecurity, housing insecurity, lacking basic health care needs and more. Did you know that the fight against poverty began in 1964 but today more than 51 percent of students in United States public schools are eligible for free and reduced lunches? The question I've been asking myself this year is, are we doing enough? What are we missing? What else is out there to help our kids? Can we make a difference? 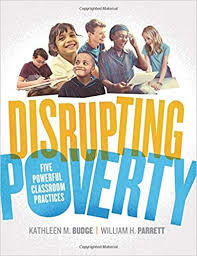 Then, I stumbled across the book Disrupting Poverty! This book is giving me hope. This book is affirming. If you are looking for a read that connects directly to our lives, I think this book is it. Here is your staff update for April 12th. I love it when things are organized and in rows! And if you add labels then I love it even more. But, to me, what’s even better than those organized, labeled rows is the mess that has to first be created in order to achieve such a level of pristine neatness. That’s right, I love tearing everything out of closets, cupboards, drawers, basements or anywhere that “stuff” exists. I love picking through the stuff, throwing things away, donating things and then organizing the left over items so they all have a proper place. Oh and of course after everything is sorted, I get to go find new things to fill up the empty space! My love of messes makes being a principal the perfect career choice for me. Think of all of the messes we get to encounter every day. Now, most of them are not created by our choosing, but some of them are. Right now, our kindergarten, first, second grade teachers and me are voluntarily making a mess. The “closet” we’re cleaning out is our word study practices and boy are we messy! We’ve analyzed data, recognized deficit areas and started digging in to sort through the things that need thrown away or put back into the closet. And, we’re shopping for new things to fill in the empty space. Think about it like this: What would happen if you never cleaned out your closet? I’m sure there would lots of things that are no longer in style and things that no longer fit (too big, of course). And, eventually, your closet would be so full that you would no longer have room to add anything new and you’d have to stay satisfied with the outdated and ill-fitting things you had in it. It’s the same for our educational practices. We need to continue to take inventory on the work we do. We need to look at current trend data and ensure that the things in our educational “closets” are working for our current needs. When they’re not, then we need to start cleaning out. I challenge you to think about things that are in your educational “closet”. Do they still fit? Is there a need that you are unable to address because you need to clean out and make room for something new? Take inventory and make a mess! You’ll be happy with the result. Here is your staff update for April 5th. For some reason, in the past few weeks I’ve noticed that many of our kids skip down the hallway. I've seen our littlest kids do this an even our 4th and 5th graders. Children have responded with big toothless grins, hugs and giggles. I challenge you to “count the skippers” too. It’s amazing how much joy it brings me each time I see a “skipper” and I think it will do the same for you! Here is your staff update for March 22nd. ​For the past 19 years I have been on a journey as an educator. I was so fortunate to have had the opportunity to be trained as a Literacy Collaborative coach. This training truly changed the trajectory of my career. I’ve written about this many times and I’m still forever grateful for the leaders who saw something in me and helped me on my journey. After my training it seemed as if a whole new world opened up to me. I understood the reading and writing process; I could listen to a child read or conference with a writer and quickly identify areas of strength and weakness which would lead me to future teaching points. And, for the past 19 years I have continued to learn about reading and writing practice within the context of the literacy collaborative framework. And, while I never believed that I would be finished learning, I must say that there came a point within the last few years that no matter what I read about reading and writing practice it just didn’t surprise me anymore. And, I was getting bored. Then, the greatest thing happened. The conversation began to change. There was a shift. We began looking more closely at phonemic awareness and phonics. I began digging into our DIBELS data and having conversations about what to do when our students weren’t responding the way our LLI intervention system indicated that they should be. I could no longer be satisfied with the answer that these children were in need of special education services and I could no longer justify keeping children in an intervention that wasn’t working without having an option of something else to try. That’s where all of you came in. I started engaging you in conversation about our data and you started asking questions and noticing that some of our kids were not responding to our teaching as well. And, YOU were hungry for more! This rejuvenated me! Just when I was getting bored a whole new world of reading instruction and a whole new set of questions opened up to me. 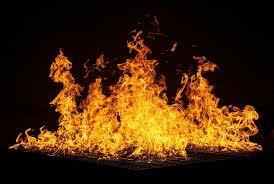 Now, for some, this could be overwhelming and stressful; but to me (and I think to you too) this was fuel! I am fueled by the possibility of adding to our instructional practice so we can do even more for our students. Today, I spent the afternoon speaking to the Director of Literacy Instruction from Marysville and a group of principals. The team shared the assessments they use; the data they collect; the ways they have adapted the Literacy Collaborative framework; their RTI model; and the additions they’ve made to the support that their reading teachers give to students. The information I gathered was so exciting because we are closer than we thought to being ready to shift our instruction to meet the needs of even more kids. What has taken them 4 or 5 years to create, we have figured out in the last few months. Our kindergarten and first grade teachers are ready to begin using an Phonemic Awareness program called Heggerty during the word study portion of the framework. We are providing multisensory phonics instruction as an option for our Title students. With a few more tweaks we are going to be leading the way in reading growth for our kids. I guarantee it. What I’ve learned the most from these recent discoveries is that I need to keep asking questions and to make sure that I do not settle by falling into the trap of “the way we’ve always done it”. I am excited for the next phase in our learning journey together. Here is your staff update for March 15th. I love the video from Tim Kight! What does "buy in" mean to you? Here is your staff update for March 1st. If you're looking for a quick read that is relevant to the work we do each and every day and that is also relevant to our personal lives than you definitely want to read this book. Michele explains that empathy is, "seeing with the eyes of another, listening with the ears of another and feeling with the heart of another. 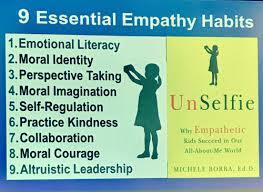 She shares the 9 Habits of Empathy with the goal of raising children who have moral courage and who are altruistic leaders. As I listened to Dr. Borba speak, I frantically took notes and starred things that I want to try with my own kids at home. 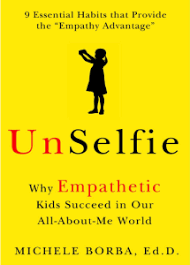 1-There are three kinds of empathy-affective empathy in which you feel how others feel; cognitive empathy in which you try to understand others; and active empathy in which you take action to help others. 2-Middle School Students expressed that they're more comfortable texting than talking. 3-For the first time ever, 3 and 4 year olds are being diagnosed with depression! 4-66% of kids report that they think THEIR PARENTS are too plugged in. They say they think their parents care more about their devices than them. We must give kids our presence. 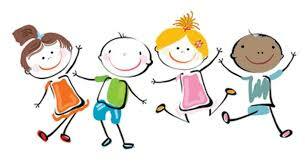 5-We must teach children to stand with their head up and to look people in the eye. 6-Every kids needs a mantra! Michele explains that kids need to rehearse who they are and what they want to do and as parents we can help them create these ideas by developing a family mantra. Form your mantra by deciding how your family want to be described by others and what matters to you. 7-How we praise matters--praise with an -er at the end. For example, "You are such a helper. Thank you for putting your laundry away!" or "You are a comforter. You really took time to make your sister feel better when she was sad!" 8-TURN OFF THE NEWS-live images of things like terrorists, murders and school shootings lower our children's empathy and raise their stress levels. Instead show children the good side of the world. Expose them to stories of people, especially children, doing good things. 9-Ages 14-16 are the key ages for moral identity formation. 10-Teaching kids to breath is so important. Below is a picture of children in a kindergarten class practicing deep breathing by taking their stuff animals for a ride. The key to breathing is to inhale slowly and exhale twice as long as you inhale. Here is our staff update for February 22nd. ​On Friday I traveled two hours west to visit the teachers and administrators in Fort Recovery School District. This small district has about 900 students and 70 teachers total. They are working with Focus3 for R Factor training and I got to be a part of their journey. What am I seeing that I need to see? What am I seeing but discounting? How do other people see the situation? We gravitate to what we know. We defer to autopilot. We prefer actions that are comfortable and familiar, rather than actions that are necessary for achieving our goals. We give up too soon. We quit before we achieve the Outcome. As I left the team from Fort Recovery, I asked them to choose one thing that they learned during our Press Pause PD that they would work on for the next few weeks. Their take-aways were inspiring and reminded me that no matter how long we have been using R Factor, we need to continue to review and build our skills. If we want to get better we must continue to get our reps in. Do you fall into any of the common Below the Line traps? Do you press pause so you can see Events with clarity and courage? Here is our staff update for February 15th. 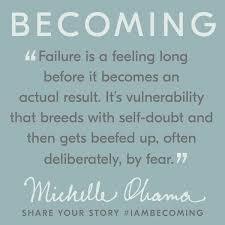 “Failure is a feeling long before it’s an actual result.” From BECOMING by Michelle Obama. Let that quote sink in for a minute. “Failure is a feeling long before it’s an actual result.” How many times have you planted a suggestions of failure in your mind or in the mind of someone else long before you or they have even tried to succeed? What would happen if we listened to these feelings of failure? Can you think of a time you let the feeling become the result? How about your students, friends or family? Do you ever plant the seed of failure? Unintentionally of course, but our words have power! Choose wisely. And, choose wisely about what you listen to. Here is your staff update for February 8th. I got to work on our snow days. I got to go to an AMAZING meeting in which Sharon Esswein graced us with her infinite wisdom and positivity. She shared the video below. It's about one minute and twenty seconds and it says it all. Here is our staff update for February 1st.